BootEditor uses all the components of bootstrap at the base and works offline to help you customize the Bootstrap Framework. You need not to know coding and can easily change the design elements of your Form, Button, Pagination etc using BootEditor. It offers live customization and you’ll see your changes in real time. It is really a cool Bootstrap Builder Software. Get All the Features You Need! Installing BootEditor is like a piece of a cake – just download the software, double click on the download setup file and you are now ready to design your CSS using bootstrap framework. You need not to be an expert to use it. BootEditor offers live customizations using Bootstrap’s default Template code, turn these file into beautiful themes. You can change multiple design elements from the most obvious ones, to complete rebranding. BootEditor offers live Bootstrap editing using Bootstrap’s default Template and turn it to beautiful themes. 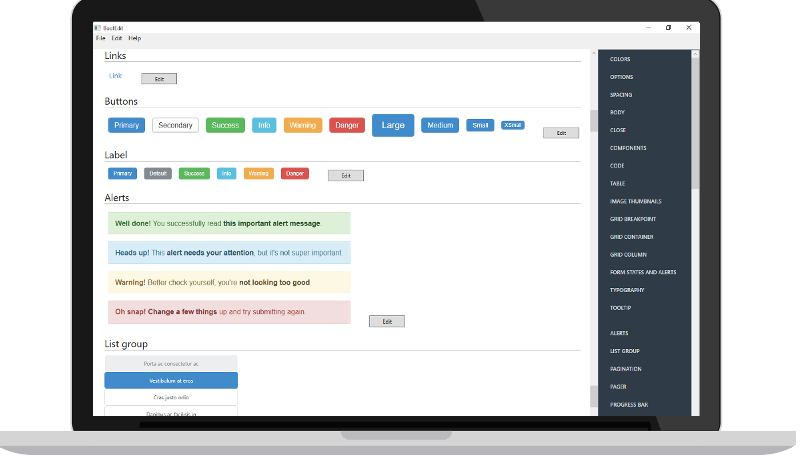 You can customize all design elements of the Bootstrap Framework to your saticfaction. BootEditor is compatible with both Version 3 and Version 4 of Bootstrap. As you all know Boostrap 4 is in alpha stage, we’ll keep in par with its developments and will be offering the new controlls and fixes accordingly. Once done tailoring bootstrap framework, BootEditor will save your beautifule CSS in its proprietory .bedt format. You can open this file back in BootEditor any time in future for further mdifications. We are quite frequent with iterations and versions providing regular updates for your favourate Bootstrap editor software keeping you in par with the latest advancements. BootEditor Forums are open for issues and general discussion, we also participate there to help new users get started and help them fix any issues related to the Bootstrap Software. BootEditor community is growing.